Founded in 1884, the Franklin Life Insurance Co. remained an important force in Springfield’s economy into the 21st century. 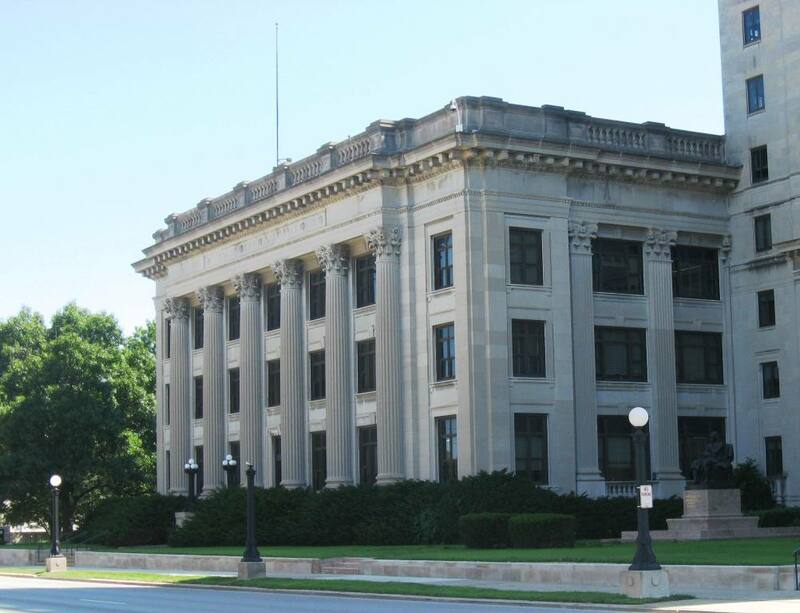 Franklin Life was founded by a half-dozen central Illinois residents in 1884. They pledged to offer up to $3,000 in insurance to “all male persons who can pass a proper medical examination, between the ages of twenty-one and fifty-five.” Payouts were to be made by assessments on members. Henson Robinson was the first president. The company continued steady but unspectacular growth over the next 50 years, reaching $100 million of insurance in force in 1920 under president George B. Stadden. However, when Charles E. Becker, a Texas insurance entrepreneur, took ownership in 1939, Franklin’s business began a rapid upswing. Franklin Life had completed an imposing new headquarters at Sixth Street and Lawrence Avenue in 1913. The Becker regime led to more expansion; major office buildings were completed in 1949 and then in 1964. The company also developed a Modernist apartment building intended partly for use by its executives, The Town House at 718 S. Seventh St. (It is now condominiums.) Even the lightposts around the headquarters complex denoted it Franklin Square (and still did as of 2013). The company also was one of the first private firms to adopt early computer technology. Franklin Life received the 15th Univac computer ever built. The Franklin lost its independence when it was purchased by American Brands in 1979. Consolidations continued — American General bought The Franklin for $1.2 billion in 1995, and the company became part of insurance giant AIG in 2001. Employment dropped from 1,300 in 1991 to about 400 in 2008, when the company moved out of its signature headquarters. The Greater Springfield Chamber of Commerce listed American General as having 410 employees in Springfield in November 2012, which still left the company ranked as the city’s eighth-largest private employer. The former Franklin complex was purchased by the state of Illinois and converted to headquarters for the Illinois State Police. Franklin Life policy information: The following information comes from commenter Lonnie Dunn. Our thanks to him. To those of you who hold Franklin Policies, I have read, and researched that the company which honors them is a spin off of AIG and they are in Houston. This entry was posted in Buildings, Business, First Citizens, Prominent figures, Uncategorized. Bookmark the permalink. 50 Responses to Franklin Life Insurance Co. Please tell me how I can contact someone from TheFranklin Life Insurance Co. Thank you. Ms. Cloutier: The Franklin has been merged, acquired, and divested several times over the years. I believe it’s still owned by AIG, whose web site lists a phone number for Franklin inquiries at 1-800-231-3655. Good luck. My parents purchased individual policies for me, my siblings, and themselves in the late 1970s. The company was sold in the 80s i believe. I’m trying to track down company name snd how to redeem the value of the policy. Please help me! Mr. Gaddy: Your question has been answered by another commenter, Lonny Dunn. Look below for older comments. You’ll see his advice. Good luck. Could you please name the seven Sangamon County residents in 1884 founders for me. I had cousins that worked there in 1890 to 1901 or 1902. One Robert C Roseberry as a supr. and his brother Thomas C Roseberry was an attorney but both worked for Franklin Life Assoc. and are listed in the city directory for a few years. Ms. Shaw: The number seven comes from The Fabulous Franklin Story, which I had checked out of the library and long since returned. The problem is that old newspaper files, to which I do have immediate access, indicate the actual number of organizers apparently was either six or nine, and not all were from Sangamon County. The list of officers when the company was “permanently” organized in July 1884 were: Henson Robinson, E.S. Johnson, A.D. Sanders, Dr. B.M. Griffith and R.L. McGuire, all of Springfield, and H.D. Day of Moweaqua. A list of organizers published that March also included the names of John Oberly of Bloomington, James Miller of Caseyville and H.C. Feltman of Salem. Hope this helps you, though it just confuses me. I’ll get hold of The Fabulous Franklin Story again to doublecheck its list. Ms. Shaw: Here’s an update. After doing some more research in Illinois State Journal files, it’s even clearer that the organizers of Franklin Life, however many they were, were not all from Sangamon County. I’ve made that sentence a lot more general in the main entry. Regarding your cousins, they are first mentioned in a March 2, 1887, Journal story about a reorganization of both Franklin Life and the Springfield Mutual Life Association, in which Springfield Mutual disappears and Franklin Life becomes the sole entity. That story reports that T.C. Roseberry had been named the secretary of Franklin and a member of the board of directors. R.C. Roseberry was the company’s superintendent of agencies. Both men remained with Franklin Life until 1901, by which time T.C. was vice president and R.C. secretary. However, they both retired at the end of 1901 and moved to California. As you probably know — but other readers may not — T.C. died in 1913 and R.C. in 1927. The Illinois State Register published a short obituary for T.C., but I found no mention of R.C.’s death in local papers. They are buried in the Los Angeles area. I’ll send you a separate email with a short profile of T.C. that was published by the Register in 1892. Thank you so much for the information, I suspected as much but was not sure. They had some personal family deaths in the late 1800’s and found information in the city directory about them. They are sons of my gg-grandfather’s sister Mary Ann Stewart Roseberry. I knew from research about them moving to California, so the information you have given me is very helpful. Hope to find T C’s obit! I had the marvelous opportunity to be shown the UNIVAC system that was still in production at the time, including being allowed to enter the small passageway into the system to marvel at the glow of innumerable vacuum tubes. I believe this would have been in the late ’60s early ’70s. Does anyone know when the system was taken out of service and what became of it? Mr. Lutze: I don’t know the answer, but perhaps someone else will. Thanks for reading. I was an agent for Franklin Life ( 1981 – 86 ). Had an annuity and some term ins. Their products were competitive and rock solid. Too bad they got ‘gobbled up’ by the BAILOUT gang. Sadly, a part of Americana past, now. I don’t know if my son has the coin bank he was given on our trip to the old home office back in ’84. It was a bust of Ben himself. Mr. LaPinskas: I think a lot of former Franklin employees, like you, have great memories of working there. Thanks for reading, and thanks very much for commenting. I was an agent with Franklin from 1974-1999. Great company, great people, and great memories. Randy: Thanks for your note, and thanks for reading. I was employed by Franklin Life from 1980 to 2000. This company was an example, in many respects, of how a company becomes a family. We had a credit union, a cafeteria, a nurse on hand, doctors and lawyers with whom we could consult and many social events. We honored our sales associates. Employees worked hard, were loyal and stayed for many, many years. Family members worked at the company, partly because they were one of Springfield’s largest employers and partly because they were a great company. Bill Alley was an intelligent, personable, tough leader who went on to run American Brands. After being purchased by American General, Franklin Life executed the first lay-off of employees (about 10% of the workforce) after a 100+ year history. The culture that had been so carefully and lovingly cultivated for a century, began to change after that. There is so much history about Franklin Life – the details of the original building, the mission statement, the products, the way lives were changed for the better . . . but most of all, Franklin Life was the essence of the people who worked there. Thank you for your article. Ms. Storm: Thanks for your thoughtful comment. This kind of dialogue is one of the things we hoped to inspire when we started SangamonLink. Vickie’s statement sums it up, and I remember her as a great Home Office professional who was dedicated to The Franklin and the sales associates (I was one of them). It was a great association – Home Office & Sales Associates. Unfortunately, times change. But the memories remain. I was an agent with Franklin. Great company. I am trying to research “National – Ben Franklin Life Insurance Corp. one of The Continental Insurance Companies” policy for my mother that my father had purchased. Is there a claims number or information number to start me in the right direction? Ms. McIntire: Unfortunately, National-Ben Franklin Life Insurance is a totally different company, unrelated to Springfield’s Franklin Life. (A lot of insurance companies once used a variation of the name “Franklin” because founding father Benjamin Franklin founded some insurance companies of his own.) National-Ben Franklin seems to have operated under that name from 1909 to 1983. It then became Commercial Life Insurance Co., which in turn merged into UNUM Life Insurance Co. of America. Your home state Department of Insurance probably can also put you in contact with UNUM. Good luck. Sorry we can’t be more help. In the case of Franklin Life, it was taken over by AIG in 2001. Your best bet is to ask the Department of Insurance how to contact AIG. Good luck. My father, Thomas S. Dunn was employed by FLICO from the late 60’s through the 80’s all of the fine calibre men and women who worked with him and for him had a great impact upon my character. He was an Executive Sales Director, first in New England, and then in the Deep South. The company was an old line insurer, with personalized service, and they had a system of recruiting agents with deep ties to the communities they served. For instance, in Vermont, Jack Durrett was President of Ducks Unlimited, Seab Hillis in Alabama eventually became a “Super Agent” with men employed across 6 states. The company focused it’s efforts on Cash Value policies, and long term savings, and financial stability. — Charles Everett Becker: Took over Franklin Life in the 1940s and grew its business dramatically. Died in 1968. — Charles Fulton Becker: son of Charles E., worked at Franklin Life for more than 50 years, retiring in 1988 as senior vice president of finance. Died in 2003. — Norval Paul Becker (known as Paul, at least in Springfield): Brother of Charles E., was secretary of agencies for Franklin Life for some period in 1940s and ’50s. (He may have had other roles too; I can’t tell from my quick research.) Died in 1996. According to Findagrave.com, Charles E. had no children named Paul. So I’m guessing your great-grandfather was Charles Fulton and that he had a son named Paul. Do I have that right? I’m posting your request and my reply in the hopes that some of the former Franklin employees who read SangamonLink can help you. Otherwise, your best bet to find out more about the roles at Franklin of any of the Beckers is to get hold of a copy of “The Fabulous Franklin Story: the History of the Franklin Life Insurance Company 1884-1970,” by Francis O’Brien (1970). I have found a 12k gold filled pen with this logo on it along with a pic of franklin. Can someone tell me about it? I am doing research for a co-worker for a policy on The Franklin Life Insurance Co out of Springfield, Illinois. His wife’s ex-husband had the policy and she was named Beneficiary. The policy was issued on July 11, 1959 and the expiry date was July 11, 2000. the policy number: 1851526. He is trying to find out if it was ever cashed out or if it has any value to it to cash out. I have the original policy. Any help on how to find out would be greatly appreciated. Ms. Slayton: Please look about four comments below yours, where Lonny Dunn has researched exactly your question and provided contact information that should help you find the answers you need. Good luck. I would like to know about an insurance policy no 2147429 holder Joseph Uskert ,Jr.
Mr. Uskert: If you scroll up about a half-dozen comments, you’ll see one from Lonny Dunn that will point you in the right direction. Thanks for reading. My husband and I purchased a insurance in 1994 and the policy number is 5670608. How can I get information. The name on the policy is Anthony Raschick. Ms. Raschick: A previous commenter, Lonny Dunn, provided information that should help. Take a look at his comment, which is about 10 comments above this one. Thanks for reading. Sorry, we have no information on any of Mr. Alley’s relatives. Thanks for reading. Chris: The button refers to an insurance sales incentive program. Franklin salesmen would have been eligible for various rewards for meeting specified sales targets during the “president’s campaign.” The dates presumably are the start and end of the incentive period. I couldn’t find anything specific about the Franklin’s 1972 president’s campaign (the search is complicated because the keywords keep turning up stories about President Nixon’s 1972 election campaign). But my guess is your button was one given out at a meeting held to rev up Franklin salesmen at the start of the campaign. Thanks for reading. Was a Franklin agent for more then 20 years. Great company I achieved a number of their sales clubs and attended many conventions. Lots a good memories. The Knights of Columbus, who taught me to swim in the church pool across the street from Franklin’s home office. Thanks! My husband, John D. Pelham, was with the Franklin for over 40 years. He was a Regional Manager in Tampa, FL and loved his time with The Franklin but he loved the Franklin Family!!! While all of us grieved over the loss of The Franklin Family structure with the field associate being highly respected, we are so very fortunate to have had the experience of wonderful memories to keep forever!!! The Franklin was and always will be one in a million!!!! My grandfather was Francis J. O’Brien, author of The Fabulous Franklin Story – what a good story it was. Corporations don’t operate this way anymore and haven’t for a long time. Wondering if anyone happens to know Franklin’s stock symbol and even stock prices from late 60’s and early 70’s. Family accountant now needs cost basis requiring stock price from that time frame in order to work out a tax issue. Hard to believe I now need info from that long ago. Any info would be highly appreciated. Stock symbol was FLIF and it traded over the counter.. The State Journal Register quoted Franklin daily as my former firm, Dixon Bretscher Noonan would give them the closing price daily. You might check the SJR during the needed time frame to find a quote. Steve: Thanks for the help. Who should I contact about the Franklin Life I purchased several years ago. I need to see if there is still money in my account. I have the number of my account and the little book that has record of deposits.I want to list holdings for my children so they know what I have . Ms. Alkofer: A lot of people have asked the same question, and a previous commenter, Lonnie Dunn, provided the following information. Thanks to your inquiry, I’ve added Mr Dunn’s information to the main body of the Franklin Life entry. Hello, My father (Bob Brady) worked in the print shop for Franklin Life. He did a 4-color run on an old web press. He had to make four passes thru the printer with exacting registration. The picture turned out wonderfully. He framed it and gave it to the president of the company. It hung in his office for many years. I spent many Sundays with him at the shop on 11th st while he worked overtime. At age 16 , my first job was at Franklin Life. My aunt also spent her working career with the company.